Weekly Recap #233: More Tai Ming 2nd Zone! 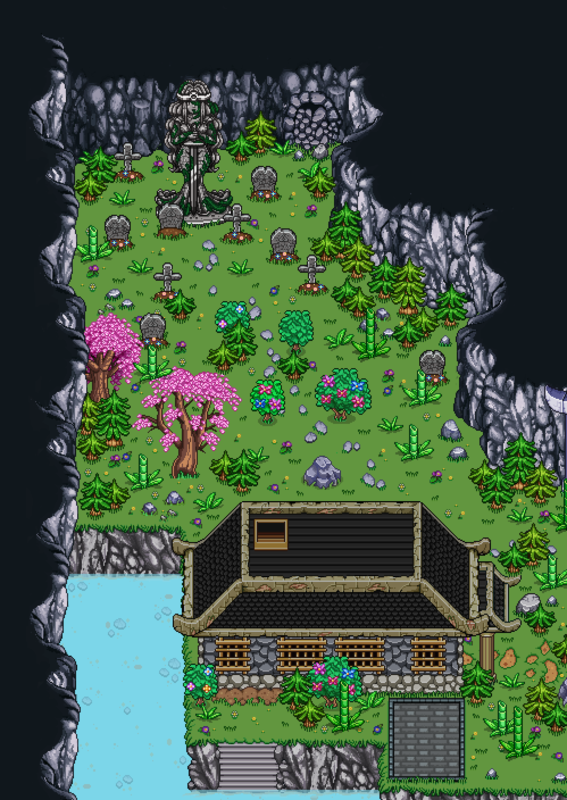 Vilya finished up the present version of the outdoors, with the exception of a few details and the area surrounding the Collector’s HQ – we might need to tweak the size of that part, so it’s paused until we’ve done some testing. Since the interior of these buildings haven’t been finished yet, it’s possible (or even likely) we’ll add or change things around once we know exactly how they look. We also plan on ruining the chimneys of the monkey lab in some way, but haven’t gotten around to that just yet! We just added a super early prototype of one of its attacks today for inhouse testing, so I’ll go back to doing that as soon as I’ve finished writing this blog post! 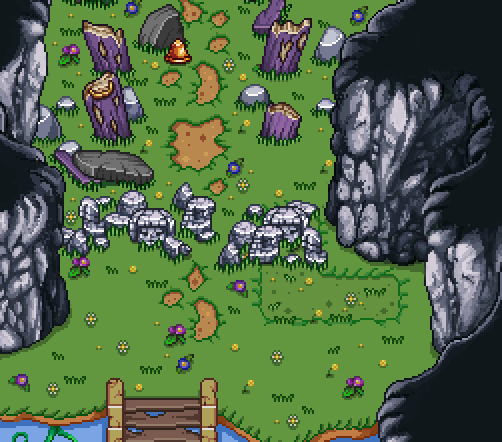 ..aaand, we’ve finally decided what to do with that locked cave in the top left corner (seen in the graveyard GIF)! Basically, the cave has turned into a series of puzzle challenges of various types. 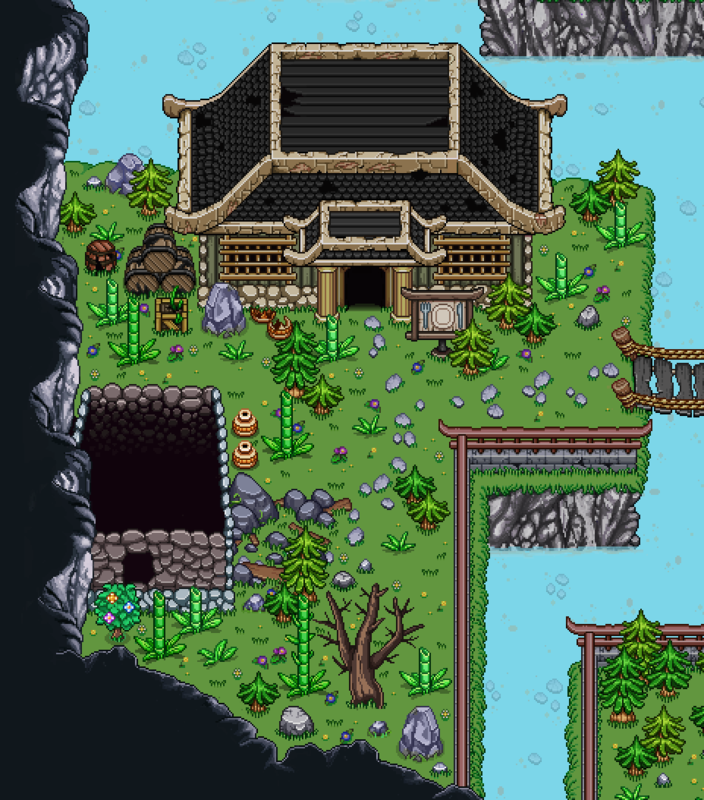 Some involve time travelling, others don’t – but the idea is that “hidden” inside the cave is a WIP ‘Puzzle World’, a place where the people of Tai Ming were supposed to be able to go to challenge themselves with some puzzles (after paying a hefty entry fee). There will be five different rooms, plus an entry room where you’ll be introduced to the theme park WIP and its owner! Here you’ll have to use the statue enemies in a creative way to solve a puzzle with several buttons! Here you need a key to get to the next room. Only problem is, there are a bunch of monkeys also wanting the key, and they won’t let you have it! You’ll have to kill the right monkey before he throws the key to one of his friends. 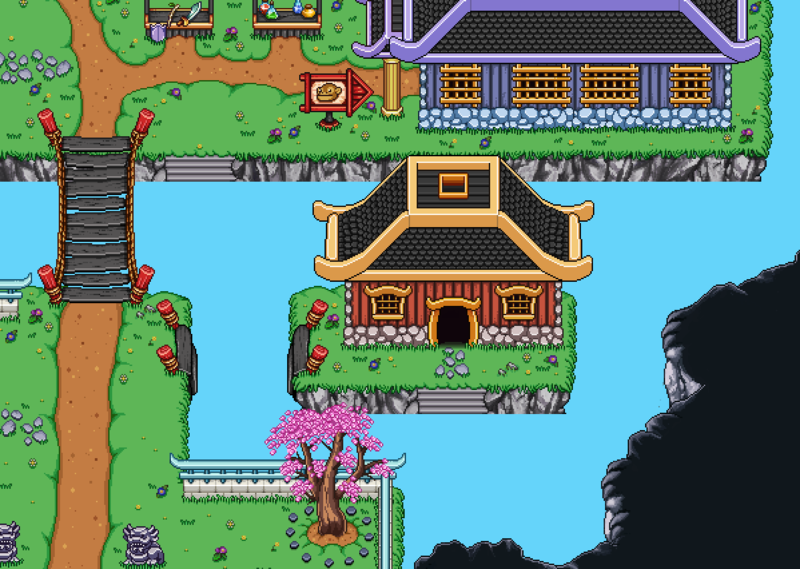 In this puzzle there will be statues (or other things), which you can move around in the past, that will fall in different direction in the present. With this knowledge, you have to push the right statue to the right place in order to fill a series of holes in your path to the next room! The puzzle here has long since stopped working, and instead you’ll have to battle a series of enemies. A puzzle room originally sponsored by the crew at the Flying Fortress, now it’s an advanced phase shifting puzzle where you have to shift through time! The monkey has two attacks: it can hit you or it can throw another enemy at you. Each enemy it throws will have have a different kind of impact as it lands: the statue sends shockwaves in 4 directions, the plant releases a ton of seeds, and the thorn-worms will simply do a ton of damage! 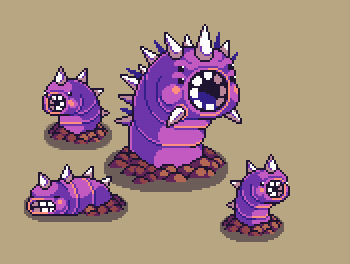 Oh yeah, right now the thorn worm don’t have the proper sprite for when they’re carried, so they kind of look like silly Digletts getting carried around, but in the future they will be rolled up! 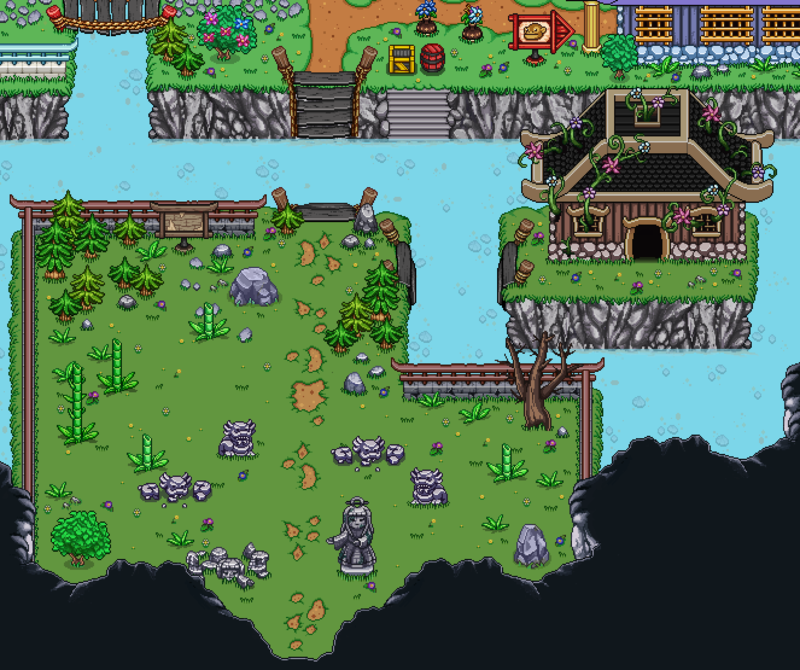 In the future, there will be decorative water effects animated along all the edges as well, making the water feel more alive! Weekly Recap #231: Small Patch, Hats & More! We’re back for another recap! In case you missed it, we already added a tiny patch to the Frontline beta, featuring some bug fixes but also a solution to a problem a lot of people have been having with the first zone! 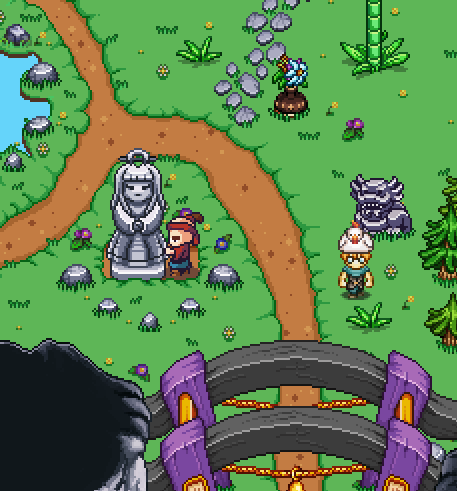 First up, we added the above NPC, pushing a statue back and forth in the top part of the map. He is based off the stonecutter in Evergrind City (an ancestor, perhaps? ), and speaking to him will further explain that the statues are light and movable! 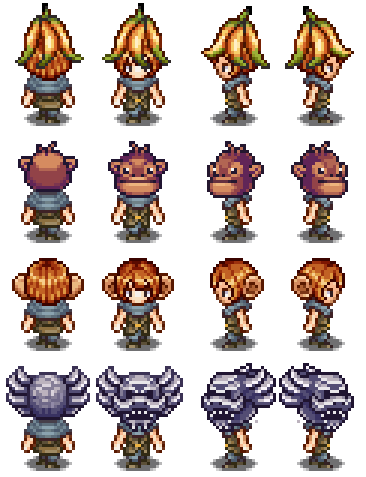 The statue hat is already in the game, while the rest will be Arcade Mode rewards or found in the next map, where the monkey enemy will be introduced! The first Tai Ming zone was released on Frontline this weekend! Wohoo! If you don’t know what Frontline is, here’s a forum post explaining what the two beta versions are, and how to swap between them on Steam. First up, we changed the Plantae Hostilis’ (or the cute little moss-enemy) attack a bit. 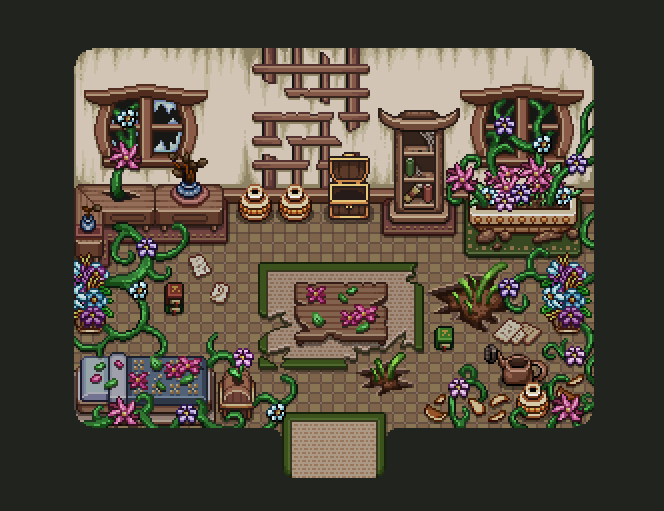 In previous iterations the flowers it launched exploded on impact (with the ground), but since then we reworked it a little. Basically we had two options that we tried out, one where the flowers took root and grew large, only to stay on the playfield for a while before exploding. Running into them would trigger the explosion as well, so you had to care where you stepped. We thought this version was the better one, in the end, since it made sure you really saw where the explosion would take place clearly (it was a bit of an issue with the old version, where they just exploded upon landing), while not filling the area with more things to avoid.